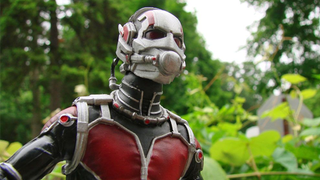 A while ago we got a first look at Diamond Select’s Ant-Man figure, complete with an even teenier Ant-Man. But now that the figure is nearly here, the company have given us a closer look at the figure — and it turns out, shooting an Ant-Man figure in a real world environment just makes it actually look like Ant-Man. I love it when companies do this. Not only do you often actually get a good look at the figures—how you can pose them, how they look in natural light rather than studio light— but also because for Ant-Man, this makes perfect sense. It’s liks a teeny tiny Scott Lang is running around being Ant-Man, rather than just an action figure. It takes a great looking toy and makes it look cooler! DST’s Ant-Man will be exclusive to the Marvel Online Store, as well as at Disney stores for its retail release. It’ll set you back $25, and will be available just in time for the release of Ant-Man next month.